If you a guitarist and you haven’t yet learned the minor pentatonic scale, then it’s a good idea to get out your guitar right now and learn it! This is especially so if you like to improvise, find yourself in situations where you need to improvise, might like to improvise in the future or if you like to write your own music. The main point of this post is to point out the minor pentatonic scale that is relative to a certain major scale, this is so you know which one of these minor pentatonic’s to play over top of that scale. Why is this is a Good Idea? If you’re unfamiliar with this scale and need to learn it, check out the link below. O.k. – so no big deal right – it’s a 5-note scale, easy to learn, so what’s the big deal? Well, the big deal kind of is exactly that it is easy. And that the pattern is the same. The pattern for the pentatonics that start on the E string are the same and the ones that start on the A string are the same. This means you really only have to learn 2 patterns and then you can play any of the pentatonic scales. Yes, this just in one position on the fretboard, but you can do a lot in that one position and it’s a great starting point, when you’re improvising. So now, as long as you can find the right pentatonic scale that goes with the key signature of the music that is being played, you can improvise over anything. But how can you tell which minor pentatonic to play without going through all of them to see which sounds right – if you don’t have a trained ear for it? That’s what we will get onto in the next part of this post. This section is all about showing the pentatonic scales that work with which major scales. But isn’t it the same? Shouldn’t A major go with A minor pentatonic? Well, it can but it won’t sound as good as using the scale that uses the same notes. Just like there is a relative minor for every major and a relative major for every minor, there is a relative minor pentatonic for a major pentatonic and a relative major pentatonic for a minor pentatonic. On top of this, you can use your relative minor pentatonic over any major key and it will fit. You can play around with adding other notes in and seeing which sounds good but if you know your pentatonic scale then you at least have 5 notes that you know will fit. For example, if you are playing a song in the key of G Major and now you play the E minor pentatonic over top, that will fit. Try it out for size – pick any song in G major and play around with improvising over top with the E minor pentatonic. What’s the Easiest Way to Find the Relative Minor Pentatonic? I find the easiest way is to use the circle of fifths and then once you’ve done it a few times you start to learn a lot of them off hand anyway. 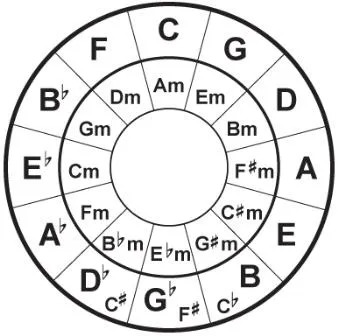 Using the circle of fifths, all you need to do is go 3 notes clockwise and that is your relative minor pentatonic. For example, find G on the circle of 5ths – now go 3 notes clockwise and you will see that it’s an E. So, the relative minor pentatonic of G major is Em. You can also use the table below to figure it out. This is of course a simple way of looking at this and there is a lot deeper that you can delve into this topic. But if you are just starting out improvising, this is a great way to get started. I know when I learned this that it opened up a whole new world for me. I went through years of playing guitar without knowing this – and though I had a reasonable ear and could work out notes that sounded good with a certain piece of music, it always took me a while and then remembering where those notes were took a lot of concentration. Learning about this just makes the whole process a lot faster so that you can find something to play, when improvising, or song writing, a lot quicker than you could without knowing it. Hope this has been able to open up a new world for you too. Experiment with this and have fun with it. Find some songs in certain keys, find the relative minor pentatonic and use those notes to play along. Have fun!